You are here: Home / News / Events / Earth Day BEE fun! Did you know native Mason bees are exceptionally hard working super pollinators? Six mason bees will pollinate one fruit tree, compared to 10,000 honeybees. 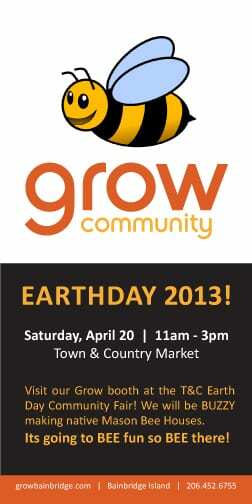 Visit our Grow Community booth at the 14th annual Town & Country Market Earth Day Community Fair on Saturday April 20th 11am-3pm where we will be BUZZY making Mason Bee Houses. Come and build one with us. Its going to BEE fun so BEE there! https://growbainbridge.com/wp-content/uploads/2013/04/Earthda1y-bee-Ad.jpg 504 252 Grow Team https://growbainbridge.com/wp-content/uploads/2018/05/growlogo-300x110.gif Grow Team2013-04-01 04:54:392017-01-30 23:50:25Earth Day BEE fun! Grow March Newsletter Grow Community homes are 5-Star Built Green!